I took ZERO pictures to document Thanksgiving 2011 :( Trav and I hosted both sides of our families again this year. We loved having everyone over and enjoyed chatting over good wine and good food! So...while I did not take any pictures, I do have a funny story to tell. Add a piece of carrot...up her nose. YES...Emma wanted to show Mia a carrot nose and proceeded to shove a piece of glazed carrot up her nose. She told Trav (as we were eating) that she had a carrot up her nose. We did not believe her and thought she was just being silly. Trav took her to the bathroom to blow her nose and to humor her and low and behold...he walked out with a carrot wrapped in a kleenex. Thank goodness it was not too big and was able to be removed by a quick blow :) Who said nothing good happens at the kids' table???? Hope everybody had a LOVELY Thanksgiving with family and friends!!! My friend, Ashley, took our family pictures for 2011. Here are a few of my favorites...minus the one we picked for our Christmas photo :) Ashley did a great job!!! 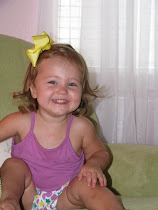 Happy 3rd Birthday Emma Grace...or should I say Precious Puppy? Emma turned 3 on November 5th. We had some friends over for a puppy party. 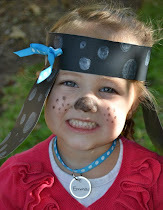 As soon as the kiddos walked into our house, they were transformed into little puppies and headed outside for some fun. First they went to the Dog Pound to adopt their very own puppy. They had to name it and get a leash. We had different stations set up for them to play with. There was the Groomer, the Pet Store, the Dog Park, and the Vet. The kiddos had a lot of fun role playing and taking care of their newly adopted pal. Kendall and Quinn in the Doghouse. Quinny trying really hard to give his meanest look. Travis made a cute puppy and had fun playing the part!!! Q with his puppy and his puppy's toy that he got at the pet store. Rowan playing in the dog park. Emma and Colby at the vet station. Kendall washing her puppy at the grooming station. Landry doing a great puppy imitation! Leah and Gabby made LOVELY pups! Happy Birthday, Emma Grace!!! It has gone by all too quickly, but it has been loads of FUN!!! Emma posing next to Charlie (our neighbor's dog) who was also a ladybug :) We all gathered in the culdesac again this year and anxiously awaited the parade of costumes. Emma was not sure of what to think of Tyler, our neighbor. Last year, Tyler showed Emma what to do at each door. He did a pretty good job because this year, she did not need any guidance. She was SOOOOOO excited to get going! Off we go! One of the culdesacs, down the street from us, had a bounce house for the kiddos. Emma had to take a break from trick or treating to try it out. That same culdesac also had a creative and creepy house. Emma loved driving by it in the days leading up to Halloween, but was not as sure on foot. She made it half-way to the door and the owner felt bad when she was startled by the snake that jumped out at her. He came to us and handed Em the candy. Emma did a great job saying "Trick-or-Treat" and walked away waving and saying "Thank you!" to all the houses. She had a blast and went to quite a few more houses than last year. Still smiling after a long night!!! I wonder what she will be next year! One of my friends wanted to take pictures of Emma in the pumpkin patch. She captured some great moments. Here are some shots that I got with my camera. We went to the Hairy Man Festival...yes, there was a Hairy Man Contest. We did not stay to see which shirtless man won the big cash prize. It is held in a park close to our house. Here is the story behind the Hairy Man. The legend of Round Rock's Hairy Man dates to pioneer days. Various versions of the local legend say a young boy either fell off a wagon as pioneers headed west or was separated from them by flood waters. However it happened, the boy then either lived on his own in the woods or was raised by local animals. Eventually the boy grew into a man and became a hermit and, well, very hairy. The story says the hairy man frequently tried to chase away strangers and would hide in the trees to scare passers by, sometimes sitting up in the tree canopy which grew over the road, dragging his feet on the top of passing stagecoaches. One day, he supposedly fell in front of a stagecoach and was trampled to death, doomed to haunt the shady road to this day. It was a HOT day. Emma enjoyed sitting in the shade and enjoying her slush as she watched people pass by. She got to stand in the middle of a juggling ring. I was also holding my breath, praying that these men were accurate with their throws. Trav said that he could feel the pins brushing by his head. Em was not quite sure what to think about it. You could tell she was afraid to move...thank goodness!!! We got her face painted by this lovely lady. It was free...a company was hosting her for a couple of hours. She was soooo quick and did a great job! At first, Emma wanted to be an abominable snowman, but then when she sat down, she asked for a bunny. And what a cute bunny she turned out to be!!! Sweet girls!!! They have sooooo much fun together!! Mia had her birthday party at a ceramics place. All the kids got to pick out an animal that they wanted to paint. Emma picked the aligator. She was pretty focused on getting it all painted! I cannot BELIEVE Mia is already 6 years old!!! Beautiful girl!! !